International Journal of Research in Health Sciences,2015,3,1,187-190. 1-Demonstrator, Department of Physiology, Gian Sagar Medical College, Banur, Patiala, Punjab, INDIA. 2-Assistant Professor, Department of Medicine, Gian Sagar Medical College, Banur, Patiala, Punjab, INDIA. 3-Professor & Head, Department of Physiology, Government Medical College, Patiala, Punjab, INDIA. 4-Professor, Department of Physiology, Government Medical College, Patiala, Punjab, INDIA. Introduction: Handgrip Strength has been shown to be a fast, non-expensive and noninvasive method to assess the skeletal muscle function in general population and in clinical assessment of patients. The present study was conducted on healthy medical students in the age group of 18-21 years to determine the normative values and to study the effect of gender and general anthropometric parameters on handgrip strength. Handgrip strength was measured using standard handgrip dynamometer. 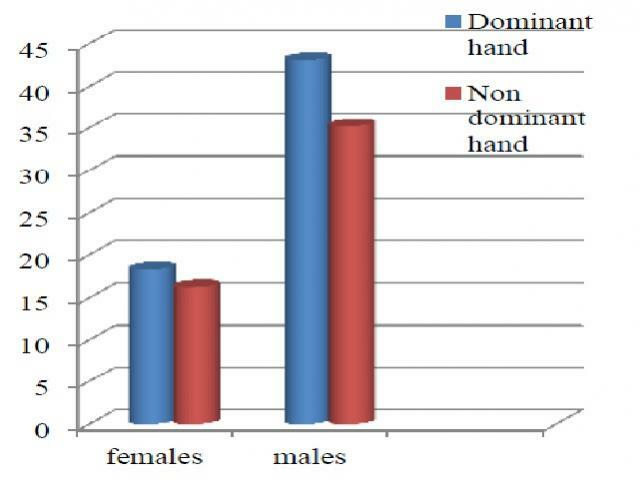 Results: In our study, the mean handgrip strength in females was 18.30±4.44 kg and 16.23±3.57 kg in dominant and non-dominant hand respectively, while in males, the mean handgrip strength was 43.07±15.04 kg and 35.20±13.87 kg respectively. Our study shows a strong correlation between handgrip strength and weight and BMI of the subject in both females and males. Our study also showed a significant positive correlation between handgrip strength and height of the subject in male subjects. Conclusion: Normal values of handgrip strength are needed for future reference. The handgrip strength is influenced by various physiological and anthropometric parameters. This effect should be taken into consideration while using it as an assessment tool.